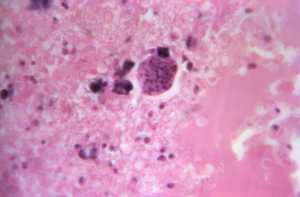 * One third of humans are infected lifelong with the brain-dwelling, protozoan parasite, Toxoplasma gondii. * Approximately fifteen million of these have congenital toxoplasmosis. * The parasite interconverts between slow-growing, encysted bradyzoites and rapid-growing tachyzoites. * In mice, T. gondii creates a chronic intra-neuronal infection and an inflammatory process. * Mice with acute and chronic infection have alterations in neurotransmitters, memory, seizures, and neurobehavior. * Some epidemiologic-serologic studies show associations between seropositivity for T. gondii and human neurologic diseases, for example, Parkinson’s and Alzheimer’s diseases. * Although neurobehavioral disease is associated with seropositivity, causality is unproven. * Serologic studies of humans with diverse genetics are not optimal to detect strong associations or directionality. * Epidemiologic associations also do not reveal parasite-modulated gene networks in human brain that could provide insights into how to cure and prevent resultant diseases. * To address these problems, we considered two central questions: (i) If chronic brain parasitism associates with other neurologic diseases, what are they? And (ii) Which macromolecular networks are modulated by the parasite in human brain that lead to neuropathology which could underpin and facilitate design of treatments? * We hypothesized that a systems approach integrating multiple levels of host parasite interactions might resolve these questions. * To better understand what this parasite does to human brains, we performed a comprehensive systems analysis of the infected brain. * We identified susceptibility genes for congenital toxoplasmosis in our cohort of infected humans and found these genes are expressed in human brain. * Transcriptomic and quantitative proteomic analyses of infected human, primary, neuronal stem and monocytic cells revealed effects on neurodevelopment and plasticity in neural, immune, and endocrine networks. * These findings were supported by identification of protein and miRNA biomarkers in sera of ill children reflecting brain damage and T. gondii infection. * “Orbital-deconvolution” elucidated upstream, regulatory pathways interconnecting human susceptibility genes, biomarkers, proteomes, and transcriptomes. * “Cluster-deconvolution” revealed visual protein-protein interaction clusters involved in processes affecting brain functions and circuitry, including lipid metabolism, leukocyte migration and olfaction. * Finally, “disease-deconvolution” identified associations between the parasite-brain interactions and epilepsy, movement disorders, Alzheimer’s disease, and cancer. * This “reconstruction-deconvolution” logic provides templates of progenitor cells’ potentiating effects, and components affecting human brain parasitism and diseases. * This work supports the hypothesis that it is at the interface of genetic susceptibility to toxoplasmosis, genetic susceptibility to these other diseases and pathogenic mechanisms, and presence of this infection, infection with toxoplasma can lead to or potentiate other brain diseases, and other illnesses. * Human chronic diseases are a complex interplay of genetic and environmental factors, requiring modified approaches to reconstruct their multifactorial etiology and cascades of developmental-plasticity mechanisms in precipitating disease. * Human brain parasitism by T. gondii provides a model and template to examine development of brain diseases. * All of our findings together support the notion that the dormant parasite, which sometimes interconverts to active tachyzoites when cysts rupture, and are present in chronic T. gondii infection in the brain of 2 billion persons, also has potential to contribute to these disease pathways of human epilepsy, neurodegeneration and cancer. * This work provides a systems roadmap to design medicines and vaccines to repair and prevent neuropathologic effects of T. gondii infection of the human brain. * Further, our original template provides a novel method to integrate multiple levels of intrinsic and extrinsic factors highlighting a way to unravel complexity in brain parasitism, toxoplasmosis,specifically, and other complex diseases. Disclosures: There are no disclosures pertinent to this work. I am helping Sanofi with a literature review but it is not really a disclosure relative to this work. Sci Rep 2017 Sep 13;7(1):11496. Epub 2017 Sep 13. This entry was posted in Alzheimer's - Dementia, Author Interviews, Infections, Neurology, Parkinson's and tagged parasites, toxoplasmosis by Marie Benz MD FAAD. Bookmark the permalink.